So you would like to run Windows 8 Metro Apps on desktop mode like any other Windows software. 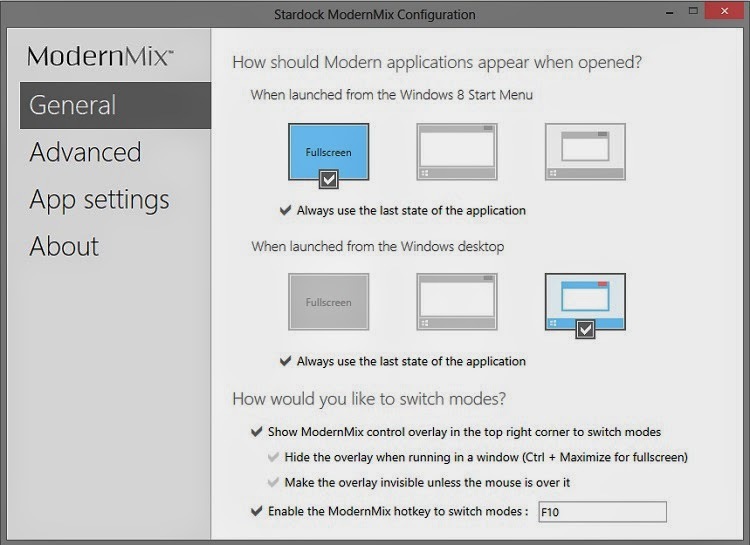 Modern Mix by Stardock can help you in doing this. You can easily switch between desktop and full screen view. When you click or run Windows 8 metro apps than it launches in the full screen mode. You can't change the size of the window and minimizing it is also very difficult task. The metro apps of Windows 8 lives in its own world and you might be facing some difficulties in browsing those apps. All the modern apps are designed in the way to keep the design of this version of Windows. If you are stuck with this than here is trick for you to start using metro apps on your desktop just like the other software which you run on your PC. Take a look at the screenshot below. So you also want to run your Metro UI Apps on windowed/desktop mode. If yes, than you should try using a software by Stardock which is called ModernMix. With the help of Modern Mix you will be able to easily switch your modern apps between desktop and full screen mode. Their are so many features of Windows 8 like the start screen, metro apps. Microsoft have tried their best to provide beautiful mobile experience to desktop users. But some users don't like some of the improvements by Microsoft like Start Screen and users start looking for Some of the best alternatives for Start Screen. Many modern apps runs only on the full screen mode and their is no to switch to the windowed mode with the help of Windows 8. Also, their isn't any way to minimize the apps and you closing the apps is also little time taking task. Stardock is famous for its rich software's for Windows. They have created many cool apps for Windows 8 like the Start 8, decor 8 etc. You can use Modern Mix to switch from full screen and desktop mode in a very easy way. 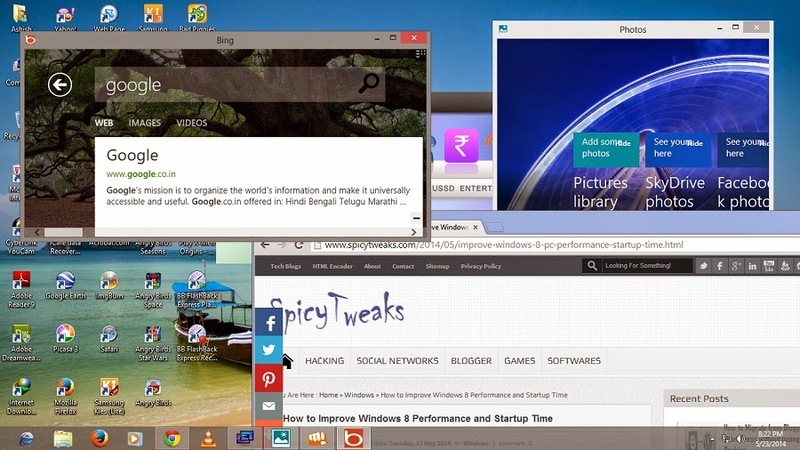 See some of the popular Windows 8 tweaks given below. If you like this tweak than you will surely like the one given below. Add custom background image to Windows 8 Start Screen. Install Custom Third Party Themes on Windows 8. How to Improve Windows 8 Performance. Now lets come to the Modern Mix app for running Metro Apps like other normal old software. You can download the software from here. But proceeding to the download page, you would like to know some features of this application. Take a look below. Help in running Modern Apps on Windowed mode. You can easily apply your custom settings. For example- it will remember in which mode you have used modern apps last time and when you'll launch the app next time, the application on that mode. You can pin modern apps on task bar. Easily switch between desktop and full screen view by pressing F10 key. But to enjoy these features you will have to pay a small price of $ 4.99. You can also use the free trial of this software and beta version is always free. That's All! I hope you're enjoying modern app on desktop mode. Keep visiting for more Windows tricks.